Slideshow: On display: Confiscated ivory in the U.S. The U.S. is the second largest market for ivory in the world, according to activists. In the lead-up to the destruction of six tons of confiscated ivory, above, the U.S. 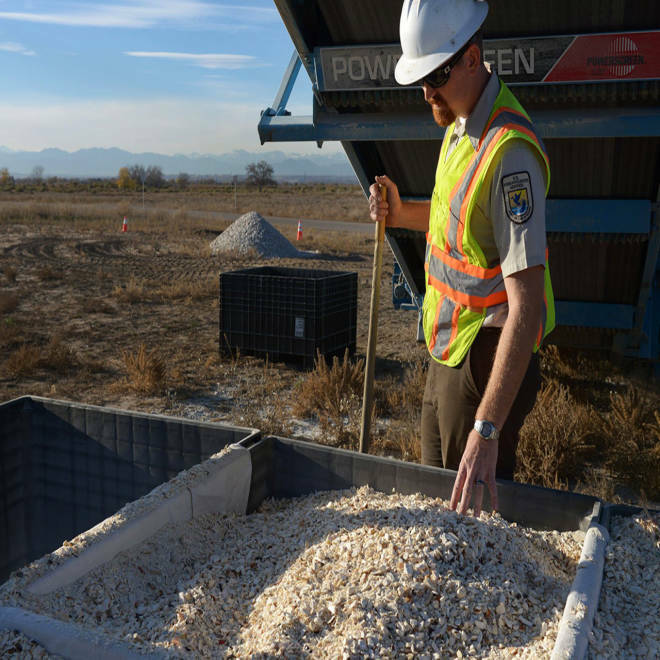 Fish & Wildlife Service opened the vaults of the National Wildlife Property Repository in Denver, Colo.
A massive stockpile of elephant ivory was crushed by the U.S. Fish and Wildlife Service on Thursday as part of an escalating push to stamp out illegal wildlife trafficking around the world. The destruction of more than six tons of seized tusks and carvings at the Rocky Mountain Arsenal National Wildlife Refuge outside of Denver was meant to draw attention to a global poaching crisis, driven by organized crime syndicates, that has decimated the population of African elephants. Watch the U.S. Fish and Wildlife Service destroy six tons of elephant ivory in order to send a message to poachers. "We're doing this to send a signal to the world that we need to crush the illegal trade in ivory and wildlife products in general," U.S. Fish and Wildlife Service Director Dan Ashe said on Thursday. "These magnificent animals are in great jeopardy because of the commercial trade for their parts." The ivory was pulverized into powder and small nuggets using a rock crusher that was about the size of two dump trucks. Ahead of the crush, U.S. Secretary of State John Kerry offered a $1 million reward for tips leading to the disruption of the Xaysavang Network, a Laos-based criminal enterprise that "facilitates the killing of endangered elephants, rhinos and other species for products such as ivory," according to a press release. The State Department said the organization has affiliates in South Africa, Mozambique, Thailand, Malaysia, Vietnam and China. The profits from the syndicate's wildlife trafficking — estimated to be as much as $10 billion annually — fund other illegal activities, including narcotics, arms and human trafficking. Confiscated elephant tusks and ivory carvings in Denver, Colo.
Upwards of 30,000 elephants were slaughtered by poachers in 2012 — the largest number in decades. Despite a 1989 global ban on commercial ivory trading, the last five years have seen a dramatic surge in poaching that threatens to wipe out the roughly 500,000 elephants still living in Africa, experts say. "Within 10 years, at the current rate of poaching, central African elephants will likely be extinct," said Crawford Allan, the WWF illegal wildlife trade expert and a senior director at TRAFFIC, a wildlife traffic monitoring network. "We will see a very bleak future for elephants unless we can turn this tide right now." And yet the fight against poaching and trafficking isn't just an issue for animal rights activists and environmentalists, experts say. A growing catalog of evidence suggests that terror groups like al-Shabaab — the Somalia-based al Qaeda affiliate behind the horrific attack on a Kenya shopping complex in September — are partly funded by dirty money from the ivory black market. 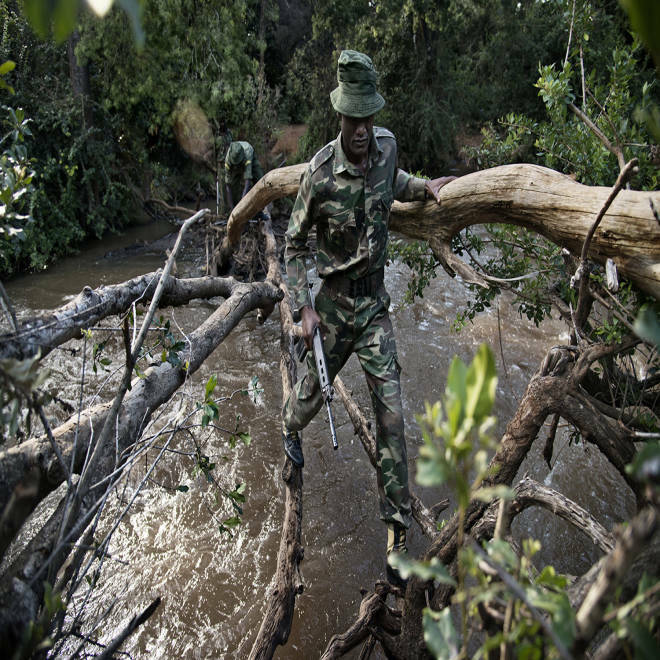 Kenya Wildlife Service rangers patrol through Ramuruti forest in Laikipia, Kenya in April. The area is a corridor for elephants. A 2011 report by the Elephant Action League christened ivory the "white gold for African jihad, white for its color and gold for its value." "The deadly path of conflict ivory starts with the slaughter of innocent animals and ends in the slaughter of innocent people," wrote the report's authors, Nir Kalron and Andrea Crosta. And former U.S. Secretary of State Hillary Clinton has said that U.S. intelligence agencies have discovered links between other militant groups, such as the Janjaweed in Sudan and Lord's Resistance Army in Uganda, and illicit ivory trading revenues. The threat posed by underground poaching and trafficking — the world's fifth most thriving and lucrative illicit activity, following only the drug trade, human trafficking, oil theft and counterfeiting — has prompted the U.S. to sound the alarms. And yet despite these instrumental U.S. moves, stemming the tide of trafficking will likely prove extraordinarily challenging, Allan said. In 2011 and 2012, elephants were killed for their ivory in record numbers. Some elephants are shot, while others are poisoned with arrows or pieces of metal. This one was poisoned in Kenya in April. "It's incredibly difficult to monitor the black market," he said, adding that many of the most aggressive bands of poachers and smugglers are armed with automatic weapons and grenades that give them an edge over law enforcement agencies. "We are being outgunned right now by these criminal syndicates," Carter Roberts, president and CEO of the World Wildlife Fund, said at a Sept. 9 event at the White House at which the Denver crush initiative was announced. "They have night vision goggles, they have helicopters, they have lots of sophisticated arms." "One of the key tools at our disposal is going to be technology and inventing new ways to catch the bad guys before it's too late," he added. The director of U.S. Fish and Game, Dan Ashe, explains the consequences of the illegal ivory trade. 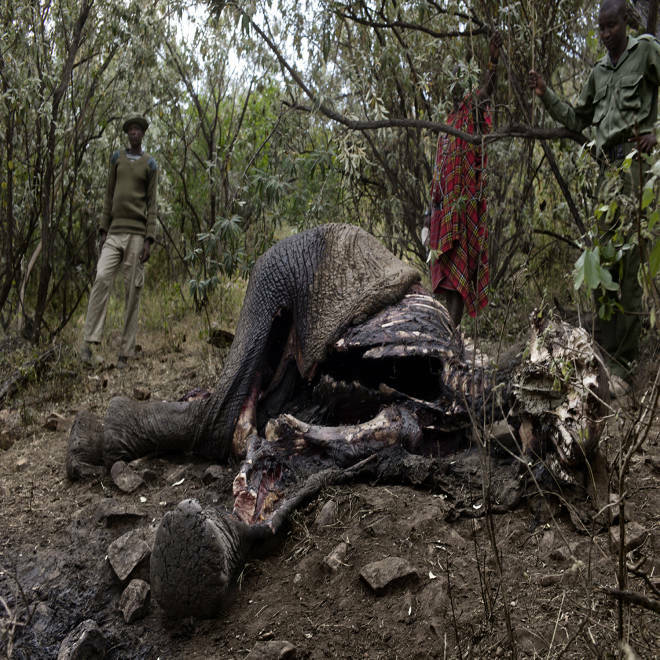 "What we saw during just this last year alone is 30,000 elephants killed," he said. What's more, anti-poaching advocates will have to contend with the voracious appetite for accessories and art made from ivory in Asia — especially in China, which represents the largest market for illegal tusks and carvings, said Samuel Wasser, the director for the Center of Conservation Biology at the University of Washington. For many people in China's swelling middle- and upper-classes, ivory items have become "important signifiers of wealth and status," Wasser said, adding that ivory pieces can be found on a wide array of tchotchkes and trinkets, from necklaces to knife handles. And yet it's not just Asia feeding the demand. The U.S. is the second-largest retail market for contraband ivory — just behind China, according to data provided by the International Fund for Animal Welfare. At least 1,165 ivory specimens were seized by U.S. border agents and inspectors between 2009 and 2012, according to the IFAW. And that figure only covers the contraband detected and confiscated by officials — likely just 10 percent of the actual amount circulating among retailers and merchants across the country. 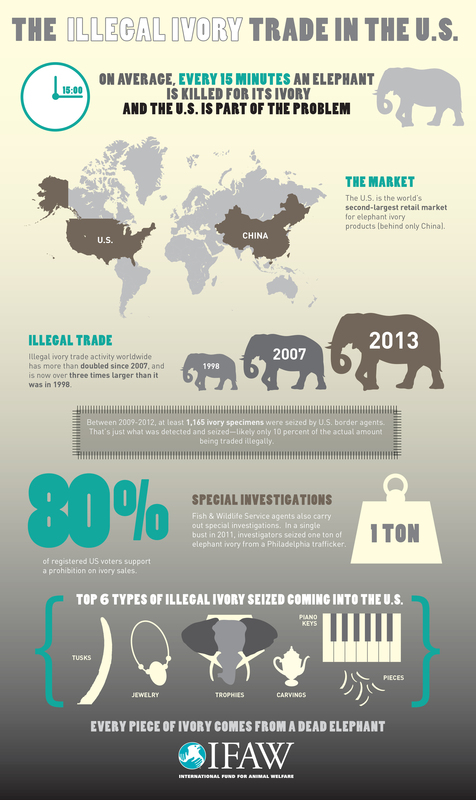 Between 2009-2012, at least 1,165 ivory specimens were seized by U.S. border agents—likely only 10 percent of the amount being traded illegally. Click on the image to read more about the illegal ivory market in the U.S.
Allan said "seizures of illegal wildlife products happen at ports all across the U.S., from Manhattan to Louisville to Denver." He added that ivory arrives in America in a variety of forms: some in large quantities via smuggling networks; some in small quantities by tourists or travelers who didn't know (or didn't abide) wildlife laws. 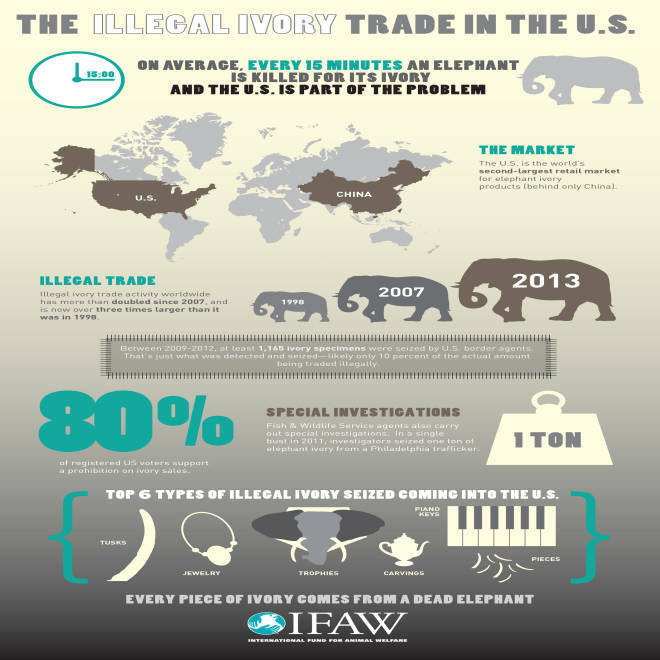 The majority of ivory coming into U.S. territory falls into six general categories, according to the IFAW: tusks, jewelry, trophies, carving, piano keys and small pieces. Items like these are sold in scores of brick-and-mortar businesses and on several e-commerce hubs. And unless the pearly material ornamenting your bracelet or Buddha figurine was crafted before the Convention on International Trade in Endangered Species of Wild Fauna and Flora (CITES) prohibition on ivory was enacted in 1989, it's likely illegal. "People may buy ivory they've been told is antique, but the reality they need to know is that the ivory may have been part of a living animal that was slaughtered just three months earlier, then carved and treated by experts to make it look like an antique piece, then sold in markets or online," Allan said, adding that it's very difficult to prove whether an ivory piece is vintage or freshly cut. 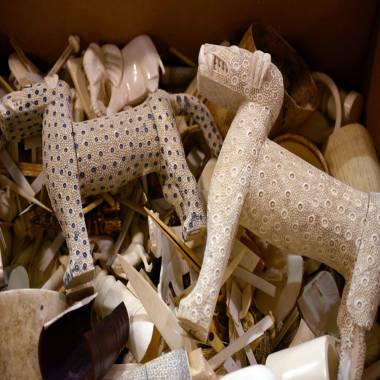 Boxes of figurines carved from ivory that have been collected over a period of 20 years sit in the National Wildlife Property Repository in Denver, Colo.
Ashe said that Americans have to be "part of the solution" in combating elephant poaching since U.S. buyers are such a large piece of the global puzzle. "Much of the world's trade in wild animal and plant species — both legal and illegal — is driven by U.S. consumers or passes through our ports on the way to other nations," Ashe said at the White House in September. "The species and habitats of our planet support billions of people and drive the world's economy. We all have a stake in ensuring their survival." Some organizations advocating for action, like the IFAW, have called for a freeze on ivory sales in the U.S. until there is a more efficient means of determining what's antique (and therefore legal) and what's illicit. We need a "moratorium on ivory until elephants are protected or regulations in the U.S. are enforceable," said Beth Allgood, an IWAF spokeswoman. Allgood said the U.S. needs an effective registration system for ivory pieces or ivory sellers. "I believe there's not time to play around with that," she said. 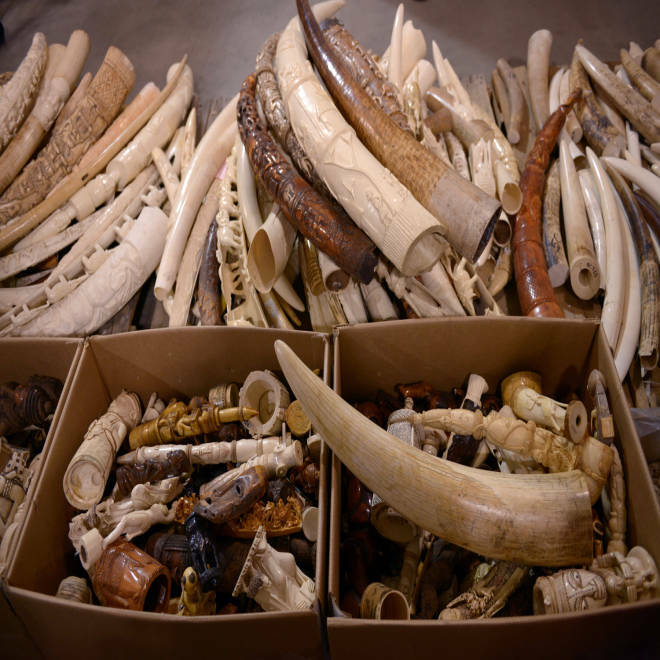 The crush in Denver is expected to send a powerful, if largely symbolic, message about America's investment in pushing back against poaching and trafficking, Allgood said. "As long as ivory have any value, elephants will be in danger," she said. NBC News producer Jack Chestnutt contributed to this story.